46023 PT ARGUELLO No recent reports. PTGC1 Point Arguello, CA No recent reports. 46218 Harvest, CA No recent reports. 46216 Goleta Point, CA No recent reports. 46228 Pitas Point, CA No recent reports. 46063 Pt.Conception, CA No recent reports. 46217 Anacapa Passage, CA No recent reports. SMOC1 Santa Monica, CA No recent reports. 46220 El Porto, CA No recent reports. 46221 Santa Monica Bay, CA No recent reports. OHBC1 Los Angeles, CA No recent reports. 46069 S. Santa Rosa Is., CA No recent reports. 46222 San Pedro, CA No recent reports. 46230 Huntington Beach, CA No recent reports. 46223 Dana Point, CA No recent reports. 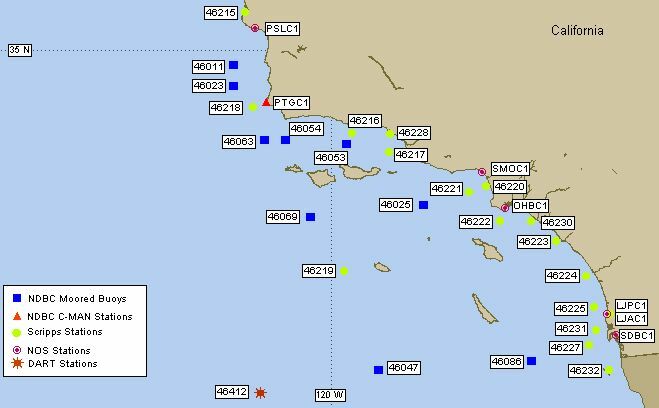 46219 San Nicolas Island, CA No recent reports. 46224 Oceanside Offshore, CA No recent reports. LJPC1 La Jolla, CA No recent reports. 46225 Torrey Pines Outer, CA No recent reports. LJAC1 La Jolla, CA No recent reports. 46231 Mission Bay, CA No recent reports. SDBC1 San Diego, CA No recent reports. 46227 Point Loma, CA No recent reports. 46086 San Clemente Basin No recent reports. 46047 TANNER BANKS No recent reports. 46232 Coronado Islands, MX No recent reports. 46412 190 nm WSW San Diego No recent reports.